Hello! Hope your new year is off to a good start! 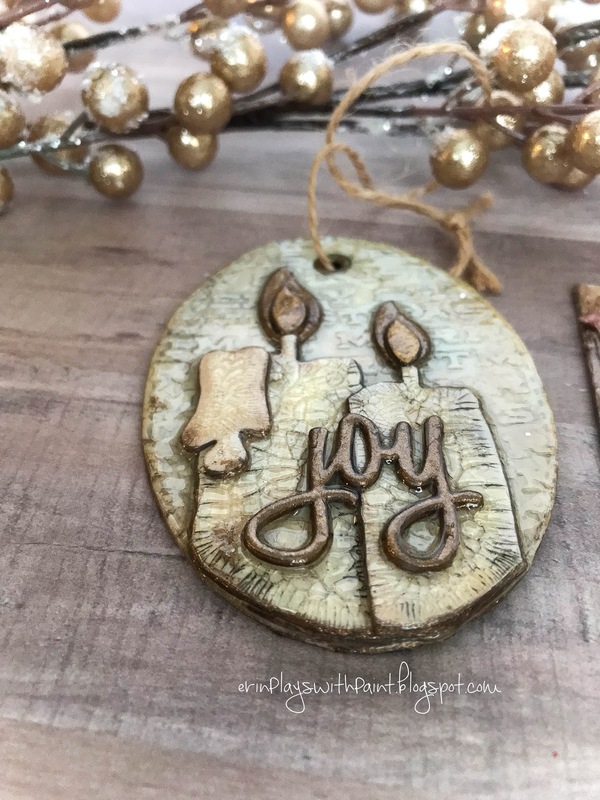 Today I'd like to share some ultra-glossy holiday ornaments I made. 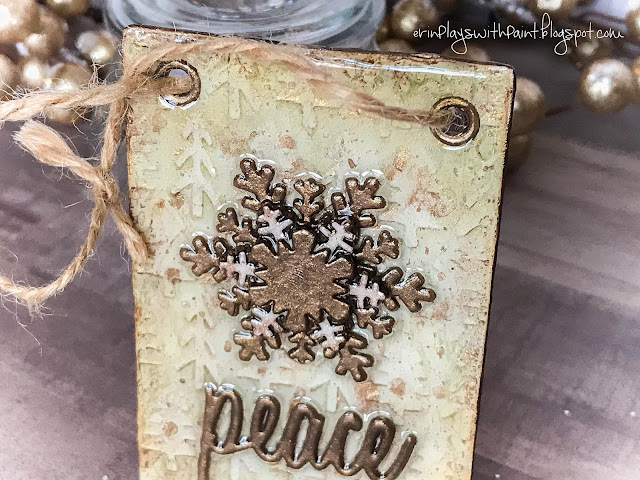 Since I'll be entering this in the Simon Says Stamp "Something New" Monday Challenge... Santa brought me some new dies, stencils, and Crop-A-Dile tool for Christmas, so of course I had to try them out. And, I thought ornaments would make the perfect mini canvases... I hope you like them! I used the Tim Holtz/Sizzix Stitched Rectangles and Ovals to cut various sizes from heavy white cardstock. I wanted them to be thicker, so I used matte medium to glue four shapes of three sizes (the two largest rectangles and second-largest oval), followed by a coat of gesso for an extra seal. 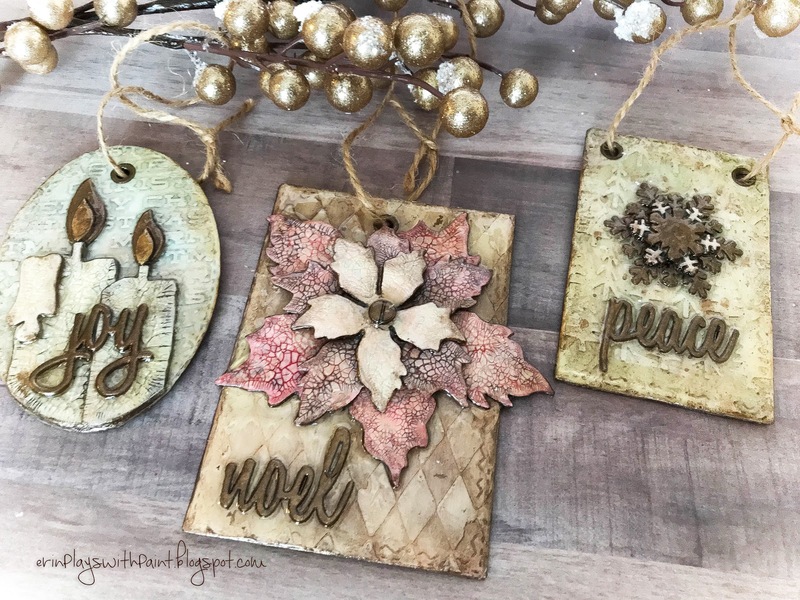 I then used a palette knife to apply molding paste over stencils on each shape... the oval is Merry Christmas in Set 32 of Tim Holtz mini stencils, the smaller rectangle is the trees in Set 32, the larger rectangle is Tim's layering stencil Harlequin. Once dry (prefer naturally, as it tends to bubble with a heat tool), cover with another coat of gesso to prep for the painting. I used Antique Linen Distress Paint to cover all three. 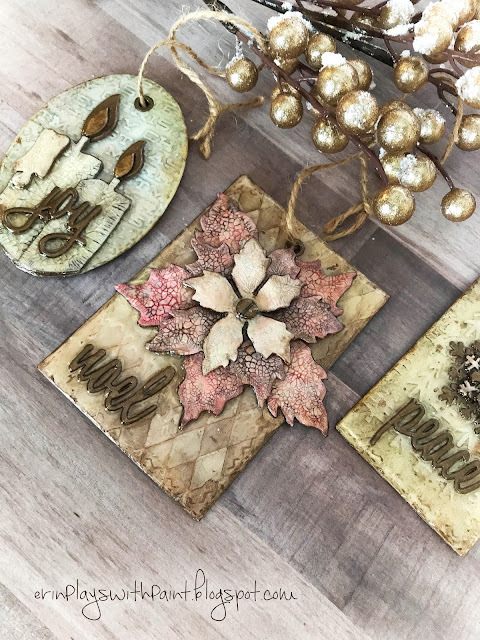 Then I lightly dry brushed Distress Paint colors over each... the oval is Weathered Wood, the medium rectangle is Bundled Sage, and the large rectangle is Vintage Photo. I used my finger to rub the edges of each shape with DecoArt Elegant Finish Metallic Paint in Rich Espresso (I've been using this stuff like crazy lately - love it!) and slightly bring out some of the stenciled areas around the edges (love it - just a hint of metallic to make it pop!). I also painted the back side of the shape in this color, just to give it a more finished look. I used Tim's Candlelight die, Tattered Posinsettia die, and Mini Snowflakes thinlits die for the focal points. I used the same process as the base shapes... four cuts of each shape, bonded with matte medium (super solid when dry! ), and a layer of gesso. Then they were coated with various distress paints and given a final layer of Tim's Rock Candy crackle. 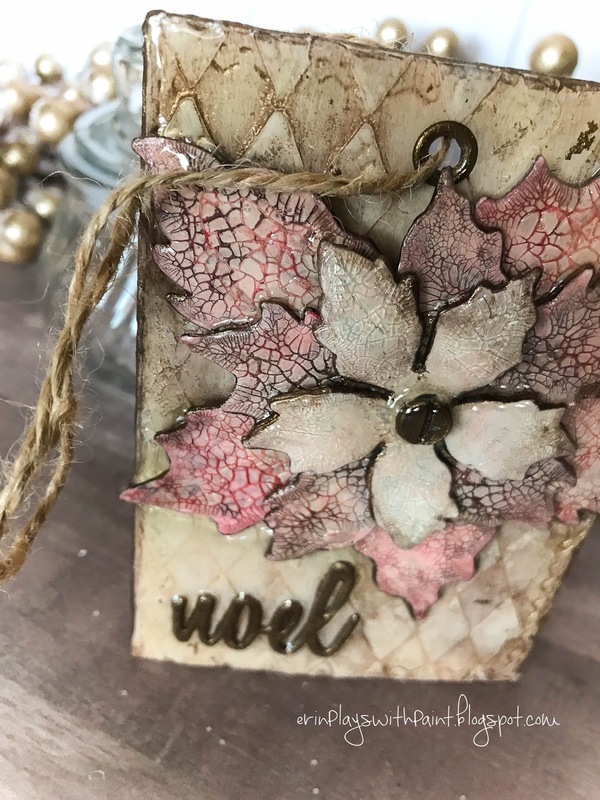 For the words, I used Tim Holtz Holiday Words Script die set. I cut four of each word, glued together, and painted metallic. For the finishing touches... I painted several eyelets metallic and set them with my new Crop-A-Dile Big Bite eyelet setting tool (especially great for thicker material! ), added a Tim Holtz Hitch Fastener to the poinsettia center, and thickly coated everything with Glossy Accents (do the same for the back sides). Add some twine for a hanger to each and voila! EXCITING NEWS: As mentioned, I entered this project into the Simon Says Stamp Monday Challenge themed "Something New" and I'm so happy to have been chosen as a finalist! I love this challenge because the quality of entries each week is very high, so what an honor!